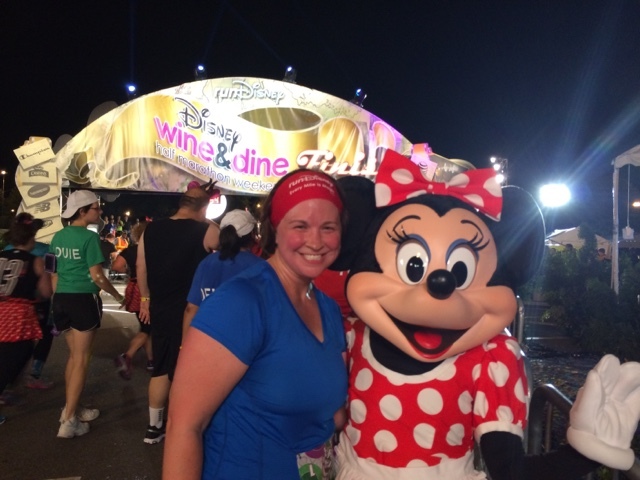 Whether you refer to it as the Wine & Dine Half and Half or the ever clever Zap & Dash, the 2015 Wine & Dine Half Marathon certainly proved to be an unforgettable evening. When we arrived at ESPN Wide World of Sports there were already thousands gathered outside on the fields. Despite the large crowds, the staff and volunteers were incredibly organized and the stop at gEAR check was quick and easy! 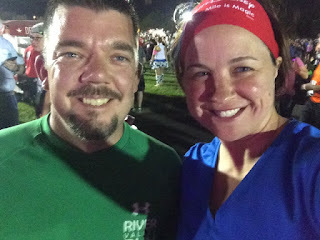 I was running the race with a good friend of mine, Craig, and after our arrival around 8:00PM, we found a spot on the pavement to sit down and rest our legs. Lines were long for pictures with Disney characters so we opted to save our photos for the race course and afterwards. The DJ was just wrapping up on stage and the official Wine and Dine pre-show began with previews of future runDisney races and the after party at Epcot's International Food and Wine Festival which was just 13.1 miles away. Can I get a FastPass for the bathroom line? As the pre-show was ending, the heat and humidity that had been surrounding the evening broke while the temperature dropped a few degrees, the wind picked up, and just a few raindrops fell. Instead of moving us to the corrals at 9PM as planned, an announcement was made that storms were in the area and we would be delaying moving into corrals. That first announcement was quickly followed by a second announcement directing runners, volunteers, and staff to evacuate from the fields and inside the stadiums at the Wide World of Sports complex. We were inside for about an hour and, besides the incredibly long lines for the bathrooms, things were pretty comfortable. The runDisney staff frequently made announcements alerting us that we remained in a holding pattern and they would let us know as soon as possible the status of the race. Close to 10PM, the original scheduled start time, we had the all clear to return back outside and begin getting organized in our corrals. 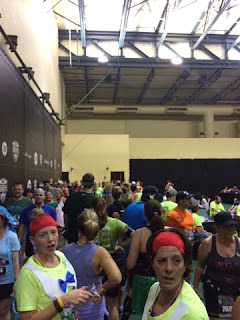 As we were heading back to the fields, rumblings began to spread through the crowds about a shortened race - anything from a 5K to a 10 miler were rumored. Once in our corrals, the official announcement came that they would cutting roughly 6 miles off of the course (the final measurement would come in at a race distance of 6.72 miles). 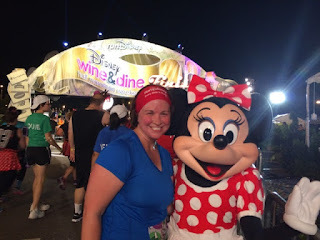 From what I've seen on social media in the hours and days following the race, the decision to shorten the course was made based on continued concerns of storms in the area, debris on the course at Animal Kingdom, time restrictions on the permits for road closures, the heat/humidity, and making sure runners had a chance to enjoy some of the after party at Epcot which was scheduled to end at 4AM. 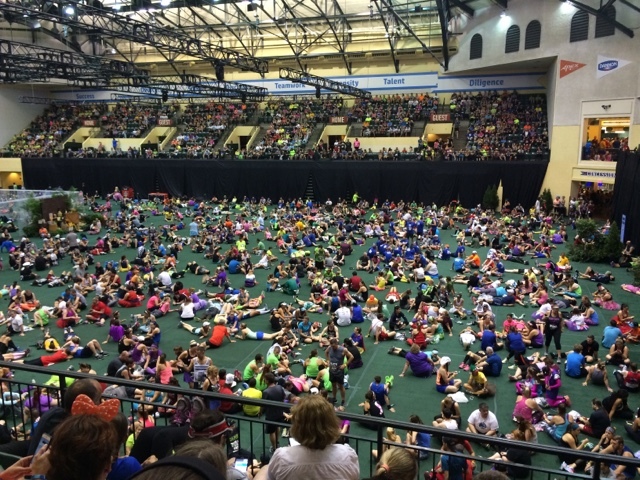 The scene inside the HP Fieldhouse. Let's try this again. . .time to race - Part 2!! The race started close to 11PM with runners in Corral A going off to fireworks and music! runDisney requires proof of time for their longer races and they use this to organize runners into corrals. Since I had not previously run a race distance of 10K or longer, I didn't have a proof of time to submit and ended up in the last corral, Corral L. And because Craig is a great friend who wanted to stick by my side for the race, he gave up his super speedy position in Corral B to hang back with me. Corrals were started roughly every 5 minutes and each corral had the chance to feel that special magic at the start line as fireworks and music were re-created with each start. We were off and running around quarter of midnight, and I couldn't be happier to finally be underway! 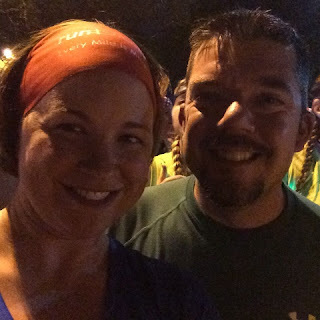 For me, the longest part of the night was waiting in the corral for our turn to start. The race course itself was awesome! runDisney keeps runners hydrated and happy with plenty of bathroom breaks available along the course and water / Powerade stations every mile. Around what should have been mile 9, they offered energy gels to all runners too. The course felt great as I train on the rolling hills of Carroll County and Orlando is flat as a pancake! There was a hill at an on ramp around the original mile 8 marker. 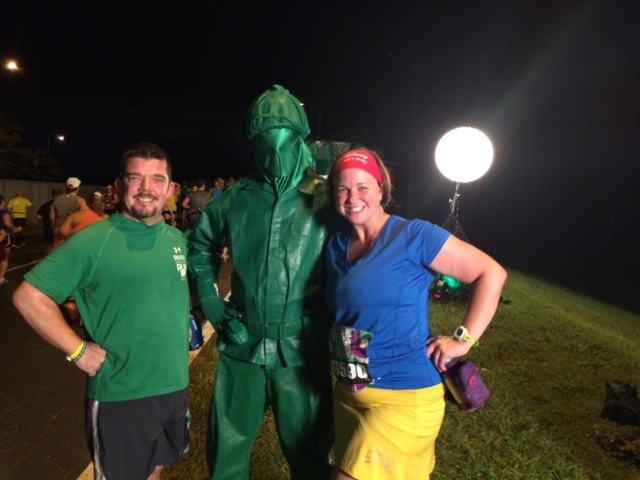 To take runners minds off the hill, Green Army Men from the Toy Story movies were there for character pictures and shouting orders at runners as they conquered the hill. "Don't you even think about walking now!" "Drop and give me three!" That was one of my favorite parts of the race! Made it to the lights! The course was supposed to run through three parks including Animal Kingdom, Hollywood Studios, and Epcot. However, with the shortened course, Animal Kingdom was eliminated. 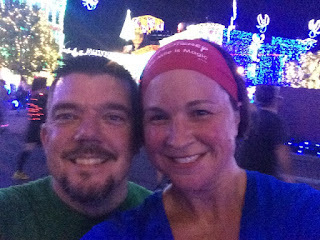 We spent a little over 2 miles on the highways and then entered Hollywood Studios. 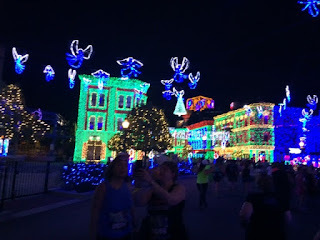 There were numerous character stops throughout the park and we had the chance to also run through The Osborne Family Spectacle of Dancing Lights. 2015 is the last year that Walt Disney World will be featuring this spectacular event and with construction slated at both Hollywood Studios and Animal Kingdom, it will be interesting to see what course changes will take place. 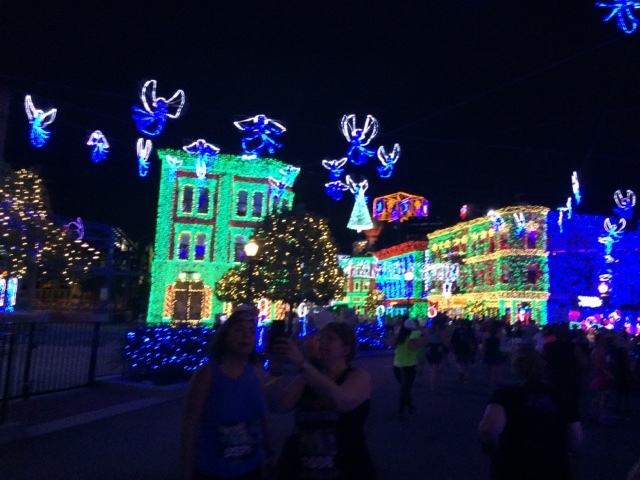 The worst part of the race course was the run between Hollywood Studios and Epcot. Runners were directed to use the walkway between the two parks which also includes the boardwalk around the Yacht and Beach Club. This walkway was long and narrow which made it difficult to keep up any kind of decent pace, especially when you get caught behind walkers who were walking three and four across. The one plus side of this area is that once the boardwalk opens up around the hotels, you are greeted by spectators for really the first time since the start as guests from the hotels are greeting runners with signs and cheers. Only about 1 mile to go! The race ended running through Future World at Epcot and into the parking area. My husband and Craig's wife were cheering us on from one of the spectator areas inside of Epcot and we knew we were wrapping up. As we approached the finish line, we noticed Mickey and Minnie greeting runners. We pulled off the course just steps before the finish line for two final pictures before crossing the finish and getting our bling! Once again the staff and volunteers get things moving smoothly at the finish with runners picking up medals, seeking medical attention, grabbing their box of food, getting drinks, and picking up their bags from gEAR check. Craig and I were both feeling great after the race despite the fact that it was closing in on 2AM. 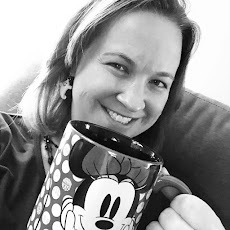 When we caught up with our spouses though, they were exhausted from hours of fun in Epcot so we opted to skip the after party and head back to our hotel. While it was a little disappointing that my first half-marathon only turned out to be half of a half-marathon, I loved every minute of the unique Wine and Dine 6.72 miler! 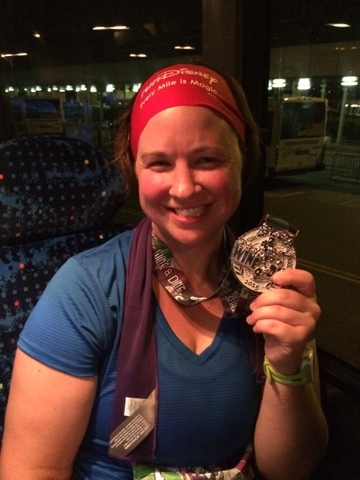 My official time according to the runDisney website was 1:37:21 which included three character photo stops and a bathroom break as well as accounting for the bottlenecks throughout the course - I'm happy with that in my longest race distance yet! 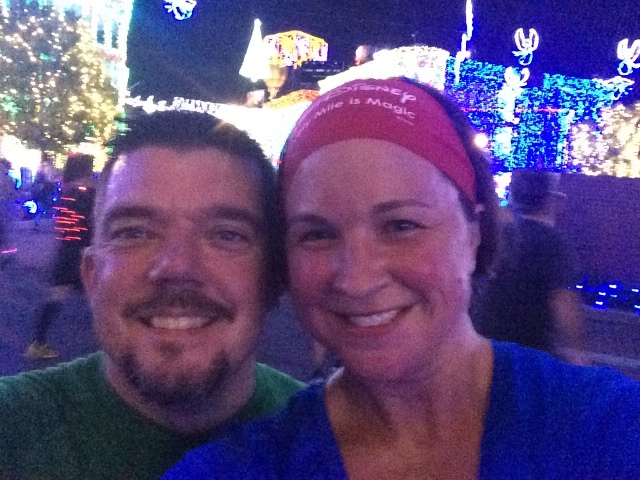 The entire weekend was a lot of fun and I'll be posting more about the Jingle Jungle 5K, the Expo, and some general tips for runDisney races that I've learned in my first experience in the weeks to come. 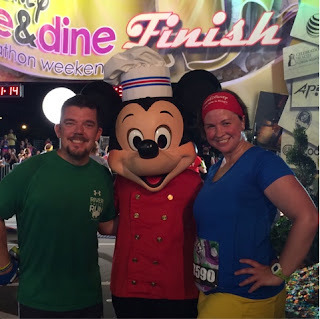 Check out all of my other runDisney articles and I hope to chEAR some of you on as you also enjoy runDisney. After all, "every mile is magic!"